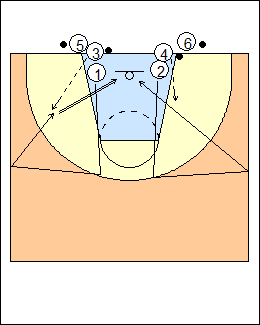 See YouTube video - Transition offence and defence. A warm-up drill, one team at each main basket (only one basket shown). 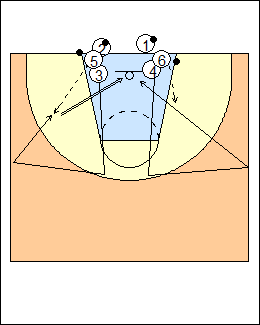 1 and 2 close out to the 3-point line with short choppy steps, throw their hands up (especially internationally, everyone can shoot the ball), take hard slides to the sidelines (wide to wider, active hands), open up with a reverse pivot on their outside foot, bust for passes from 3 and 4, 1 catches for a mid-range jumper, 2 lays it up. 1 and 2 rebound their shots and change lines, 3 and 4 go next, getting passes from 5 and 6. First team to 6 makes, repeat changing sides for the jump shots and layups. - drive middle for a jump shot at the elbow. See Shooting - Mike Procopio warm-up, Catch and shoot, Noah Basketball, Defending - Nash triangle slides, Rudez closeouts.